Sheer Cover is another one of those brands that’s promoted by a celebrity. Leeza Gibbons is a spokesperson for Sheer Cover, and you can see a video of her at their website. I personally have not tried it before, but I promise that as soon as I get the chance, I’ll buy it and give you guys my review…promise. I’ve heard that they ship really fast, the price isn’t bad for just $29.95 plus shipping & handling. You can buy it here, and I’ve also heard that the mineral foundation is the best product in the kit, but feel free to add your review of any part of the 30-day kit below. What? Mineral Makeup is Not Regulated? CBS recently posted an article about the fact that mineral makeup is not regulated under FDA guidelines. “They’re not regulated by the Food and Drug Administration so you are pretty much at the mercy of the company,” said Deleo. This actually isn’t new news to me. I’ve always known that mineral makeup isn’t regulated by the FDA, and that’s why I frequent the online forums and review sites, just to get a real opinion. An opinion that matters, yours and mine. “I break out a lot less with this and it’s natural it feels lighter,” said one. “It goes on really smoothly and it’s flawless,” said another believer. I’ve heard comments like that all over Makeup Alley. But, I’ve also heard that it can be quite itchy to some skin types. So, be sure to do your research. Ok, so I’ve been waiting to get my hands on this line ever since I heard about it in Lucky Magazine. I must admit that I’m very impressed. I really think that it was better for me than the Bare Escentuals and their mineral line. 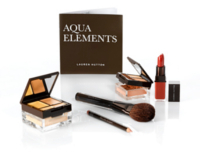 I’ve heard a lot of people comparing this Lauren Hutton Collection to the Bare Minerals line, but again, I gotta say that I liked it better. As with any makeup, I think that your skin tone and texture will most likely determine whether or not you like the stuff. She has a little more info on her site about skin tone, so you might want to check it out. If you already know which one you wanna get, you can just go here. You can see some reviews from around the web, and from my readers below. Don’t forget to leave your review as well.